A small pond near Windsors Malbay on Miscou Island, New Brunswick. This site was a known fall staging area for migrating dough birds. 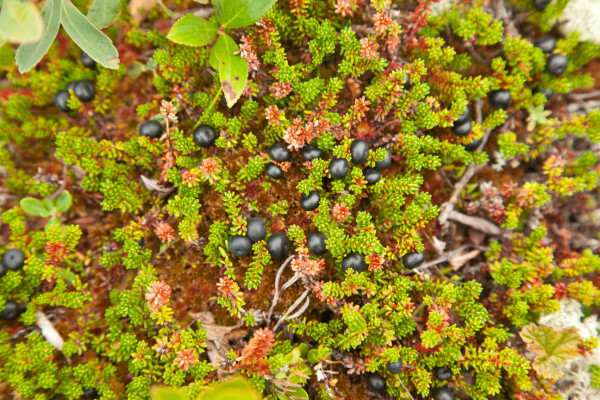 Crowberries were the primary fruit used by dough birds to fuel their transoceanic flight from eastern Canada to South America. They ate so many of these berries that their bellies were often dyed purple. Photo by Bryan Watts. Like a summer carnival coming to a Midwestern town, wherever Eskimo Curlew went their arrival was the most anticipated event of the year. They were travelers along the Great Circle. From breeding grounds around the Mackenzie River they flew east to the Canadian Maritimes before making a nonstop flight to South America. Incredible numbers wintered on the campos around Bahia Blanca south of Buenos Aires. In the spring they flew north to Texas then on to the Platte River before returning to breed on the Mackenzie. They were loved wherever they went. 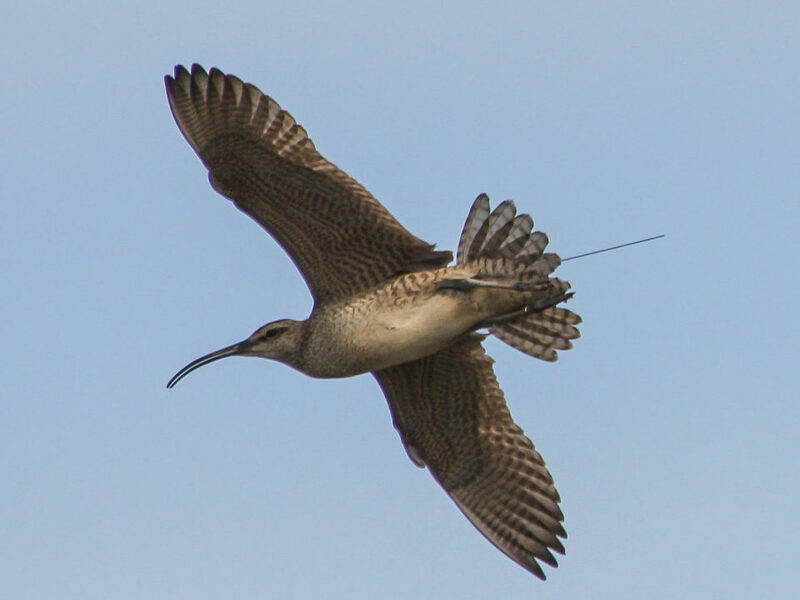 Described as the most delicious of all shorebirds, they appeared on the menus of posh restaurants in Buenos Aires, New York City, Boston, Chicago, St. Louis and New Orleans. They were canned and shipped to wealthy epicures in London. Hunters from the northeast called them dough birds because when they were hunted in the fall the birds carried so much fat that when they dropped to the ground they occasionally split open, revealing the white fat that appeared like balls of bread dough. A small pond near Windsors Malbay on Miscou Island, New Brunswick. This site was a known fall staging area for migrating dough birds. Photo by Bryan Watts. When demand drove their price above 75 cents each, the traveling dough birds became a moving industry. By the 1870s they were hunted somewhere every day of the year. The Honorable F. C. Berteau, a custom’s agent, describes coming into the Hudson Bay Company’s store in Cartwright Labrador and seeing 2,000 birds hanging that were shot by market hunters the same morning. Professor Myron Swenk from Nebraska describes the spring hunters from Omaha shooting flocks on the plains until they filled their wagons and had to put on higher sideboards. After successive years of low numbers, George Mackay, a sportsman from Nantucket, polled two Boston dealers in 1890 who indicated that they had received twenty barrels of birds from the Midwest including eight barrels of dough birds and twelve barrels of golden plovers and dough birds. By the end of the 1890s the traveling carnival was over. The weight of a relentless harvest had broken the back of the population and it fell into a hopeless death spiral. By the 1930s, final sight records had been recorded over much of its former range. 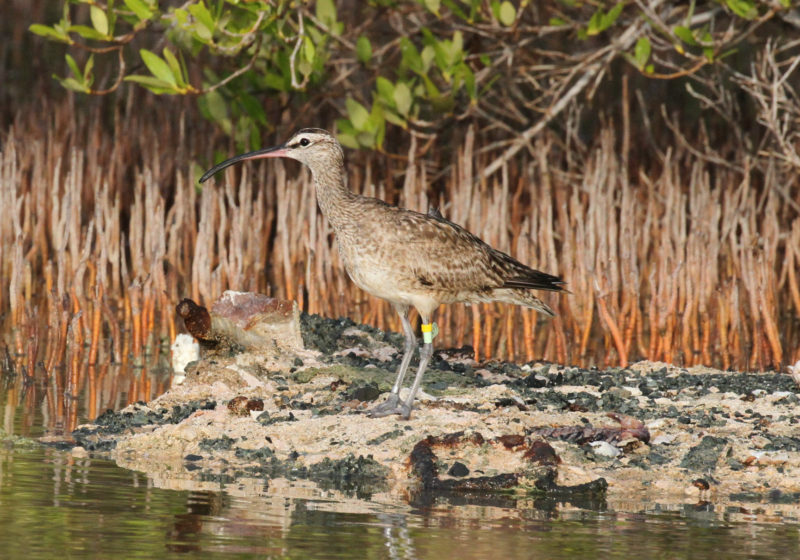 The last individual known to science was shot on September 4, 1963 over a shooting swamp on Barbados, one of several shorebird-hunting holdouts that persist to this day. This September marks the 51st anniversary of that last confirmed bird, now preserved forever in the Academy of Natural Sciences in Philadelphia. In the early 1900s, during the later years of the decline, many hunters lamented the loss of the population. Dough birds were a significant component of local cultures. The sight and sounds of flocks writhing over the horizon marked the seasons and filled everyone with a sense of life no matter how bleak the day. Today, there is no living link to those experiences. We have only the few written words to bridge the gap of time. 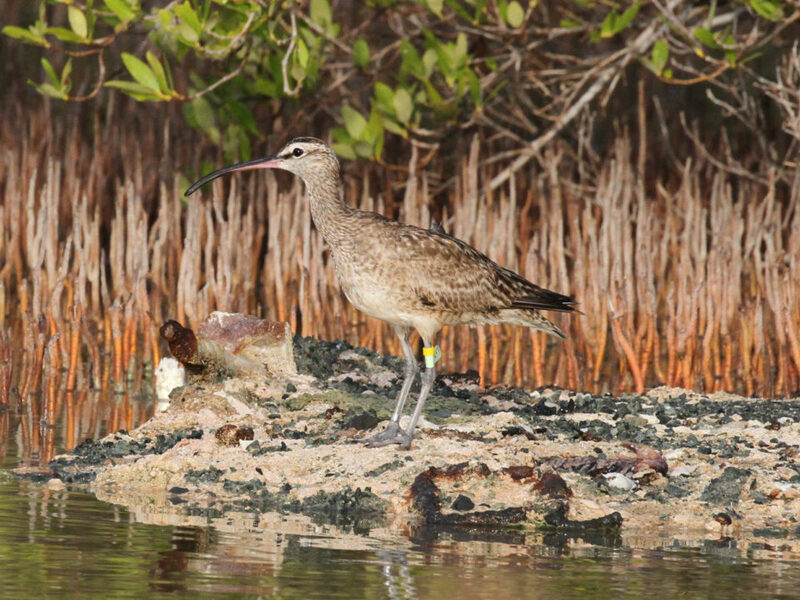 Henry Hall from Massachusetts sums up the disconnect stating, “Our chief reminder of its former status is an occasional dusty decoy for sale in some antique shop….” One of the most charismatic shorebirds in the Western Hemisphere that was once estimated to number between 3 and 5 million individuals, now confined to libraries, museums and antique shops. 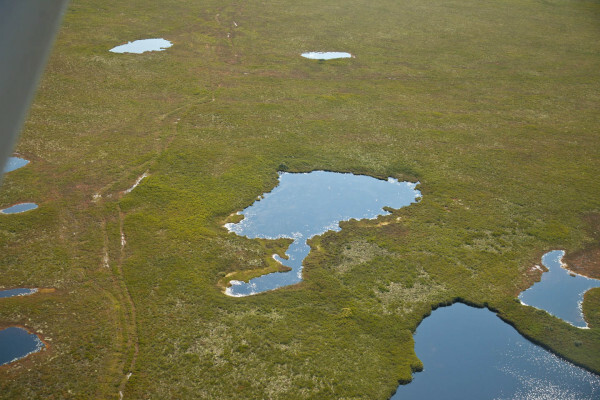 Wagon tracks extending through the bog are the only reminder of the hunting camps from the 1800s on Miscou Island. Photo by Bryan Watts. As ecologists, we rely on first-hand experience to get to the marrow of a species. We commit years to the effort – we wake up with it, walk with it through the day, and sit with it for months in its habitat. We talk to others about their first-hand experiences. Slowly, through the commitment of years, a vibrant, ecological image begins to take form. We begin to know the species to a depth achieved only with close family members. Despite the demands of our fast-paced world, there are no short cuts to truly understanding another species. But for some species, our arrival on the scene comes too late. 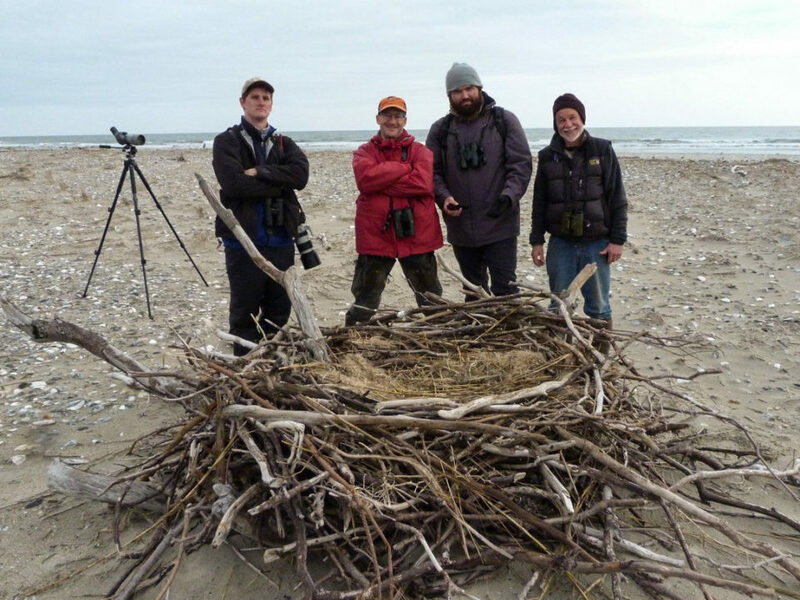 Recently, while conducting shorebird work with the Canadian Wildlife Service, I had the opportunity to spend two evenings on Miscou Island in New Brunswick during the peak season when the curlews would be staging. The island contains extensive heathlands that support dense populations of crowberry, the primary food used by dough birds to lay on the fat needed to make their transoceanic flight to South America. The island was a famous hunting site for the species. Dr. Orne Green spent 30 seasons hunting the area following his retirement in the 1870s as a professor from Harvard Medical School. 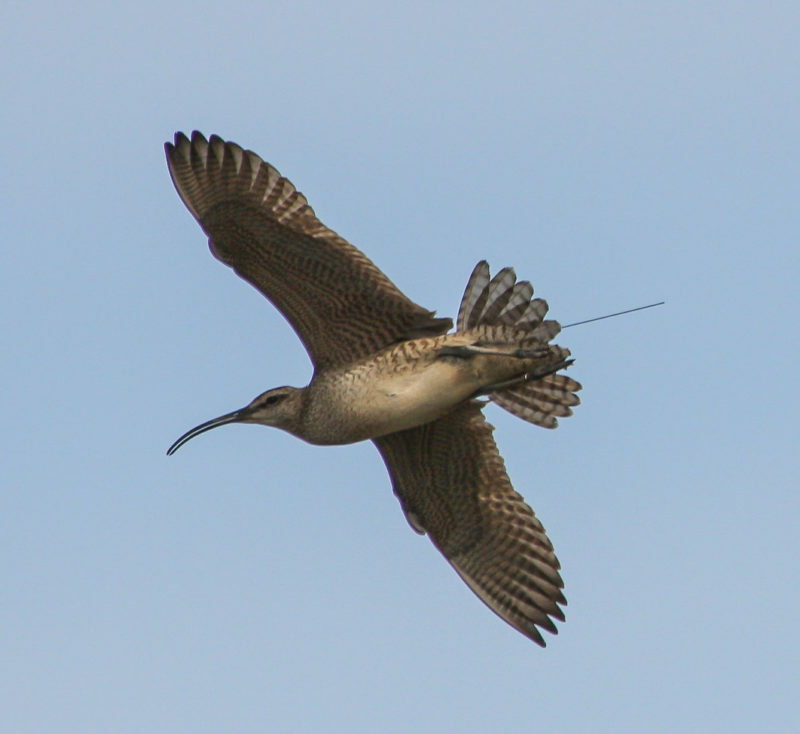 His and other writings describe the shanties, camps, and hunting blinds positioned to intercept birds along the major flight lines between roosts and foraging areas. It is utterly impossible for an ecologist to walk through such hallowed ground without conjuring up the ghosts of a species so recently extinguished. 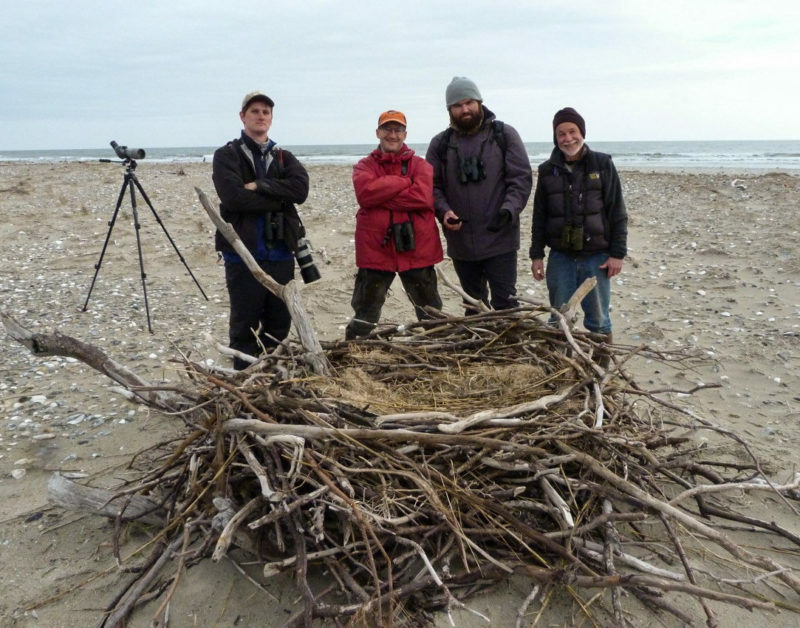 What does the architecture of the habitat say about the species that used it? Are there ecological echoes that persist here from their occupation? Has any other consumer come in to fill the vacuum left in their wake? You strain your senses to capture the setting and imagine what it must have been like to be among them – the smell of peat underfoot the sound of the wind pushing the water against the shoreline, the subdued greens of the heath plants. 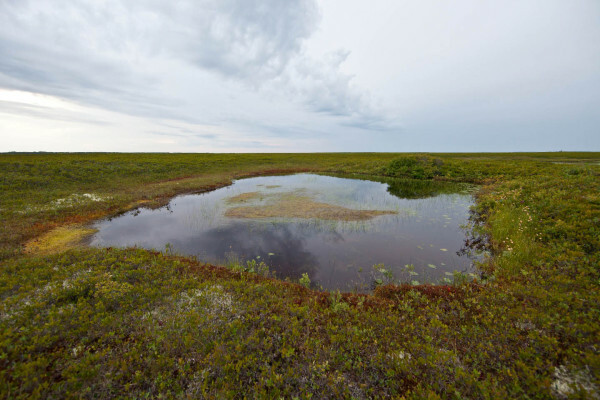 Today, the vast habitat patches on Miscou Island are spectacular – a base of sphagnum covered with a carpet of miniature plants including cloudberry, bog rosemary and sundew. Though very diverse, the plant community presents a low profile, allowing birds to walk unimpeded. There is no evidence of the camps and blinds of Dr. Green’s day. 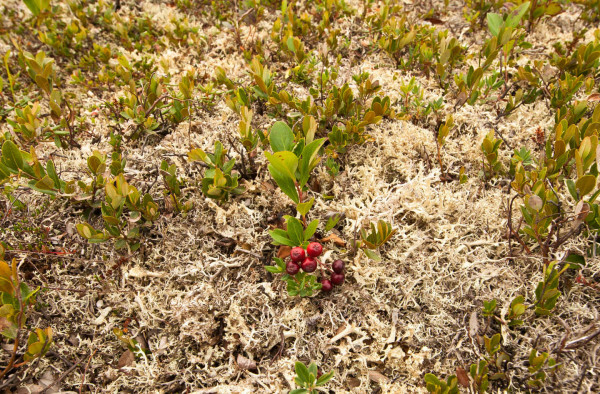 In some areas, every step falls on ripe crowberries that cover the ground in dense patches. There is a peace and an undeniable timelessness here. 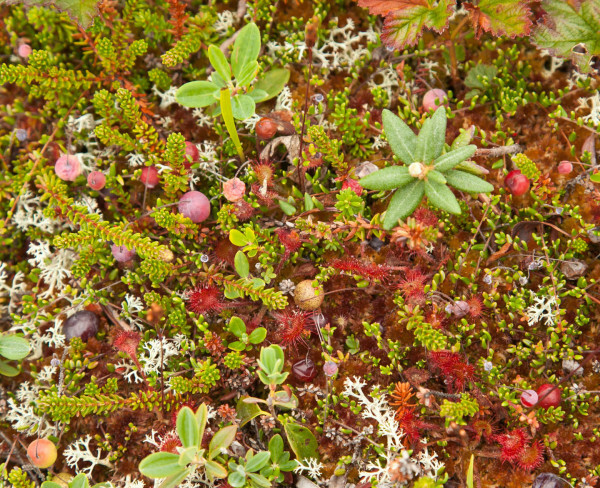 The heathlands of Miscou Island are covered with a mixed potpourri of miniature plants including the delicate sundew. Photo by Bryan Watts. It is difficult to find any impression left by the throngs that once stopped in the fall. The carpet of sphagnum is dotted with lichens that must be hundreds of years old. They would have “felt” the footsteps and been brushed by bills of dough birds marching across the heath gorging on fruit. But the lightening that once electrified this landscape is gone. There is no rush of wings dropping from the sky like a waterfall down on the crowberries to feed, just an emptiness that stretches from horizon to horizon. Mounded lichens are dotted across the heath bog on Miscou Island. Photo by Bryan Watts. It is tempting to comfort ourselves in the belief that the dough birds were casualties of a historical moment not destined to repeat itself. A brief time sandwiched between the sharp rise in available firearms and the passage of protective legislation. After all, didn’t we pass the Lacey Act and the Migratory Bird Treaty Act nearly a century ago to protect these species? We would only be deceiving ourselves to find comfort in such an illusion. The extinction of the dough birds was driven by the tragedy of the commons, a force that stretches back before human civilization itself and that is still alive and well today. The market hunters that encountered the birds in different places throughout their annual cycle were more concerned about their own profits and enjoyment than they were about the future of the birds or about the other hunters along the Great Circle. We may legislate hunting regulations, but what about the destruction of critical habitat, the consumption of coastal resource or human-caused climate change? Until we are all able to rise above our own self-centered concerns to see a future beyond our own and recognize that cooperation is not merely a kind gesture but an imperative for the future, no species is secure, not even our own.